First comes love … then comes a house … then comes marriage. 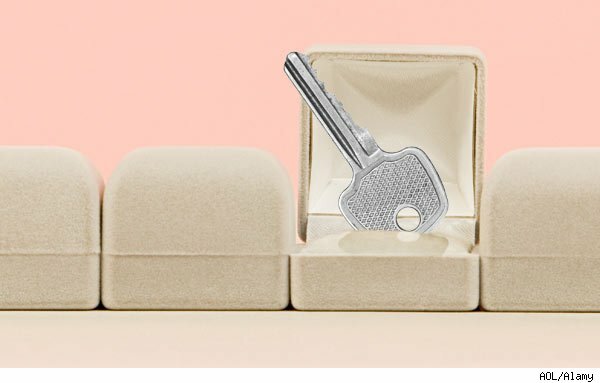 Getting hitched may not be the ultimate sign of commitment these days as more and more couples opt to buy a house together before walking down the aisle, new research shows. Nearly 1 in 4 married couples ages 18 to 34 purchased a home together before getting married, according to a recent Coldwell Banker Real Estate survey released this week. That compares to just 14 percent of married couples ages 45 and older. For Zina Miranda and her fiance, Steve Roman, both 24 (and both pictured at left), buying a house was the next logical step after getting engaged. They’re not due to marry until May 2014, but this June will mark their five-year anniversary, and they were just ready to take the real estate plunge. The couple recently bought a house in Patchogue, N.Y. Does she think that buying a home proves their commitment to each other even more than getting married? “On some level, yes,” Miranda said. 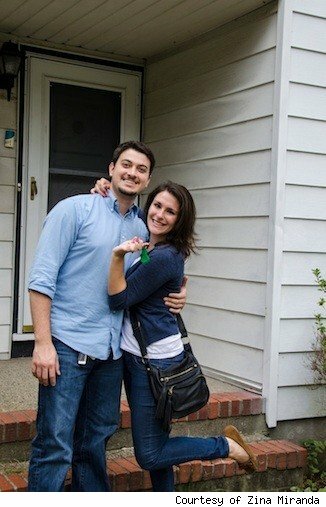 The couple’s venture into homeownership is doubly important to them: It’s the first time they’ve lived together. “This is the house I could live in through the rest of my life,” she added. While that might be a beautiful thing for young couples in love, the legal ramifications of buying before marriage could be a little uglier. John Braun, a real estate attorney at Thomas Law Group in Minneapolis, said that he has one word of advice for couples buying a home before marriage: Don’t. If you buy a home before marriage, Braun explained, you basically sign a contract that gives you both equal ownership of the house, but not joint ownership (at least until marriage). In the event one of the partners dies, their share of the house goes to their heirs, not the other partner. And if you never make it to the altar and break up, well, “you are left owning a piece of property with someone who is wishing that you would die,” Braun joked.